Fresh-water fish are special in part because fresh water seemingly isn’t. It’s the transparent stuff that human beings drink and bathe in. It’s an everyday thing that, in most parts of the world, falls regularly from the sky. And yet very strange creatures live in it: fish, which breathe water and drown in air. That inversion of normality doesn’t seem so remarkable in the sea: the saltiness of the water doesn’t seem to contradict the strangeness of the citizens, as it were. Instead, saltiness and citizens go together. The difficulty of keeping a marine aquarium seems appropriate too. What else should you expect? But a freshwater aquarium seems special in part because it’s so simple. Even if the water has to be heated, it still seems everyday, like bathwater. But it’s bathwater with aliens in it. In truth, of course, it’s human beings who are the aliens. Water is where life began. Fish are still there, breathing in the natural way, not the unnatural one. The ocean is the womb of life and when life left the ocean, it had to find ways to re-create it. Blood is a portable ocean and human beings have gills for a time when they’re embryos. We were fish once. Fish still are. But they’ve continued to evolve and to find new habitats. As the introduction to this book points out, moving from the sea to fresh water is like moving from a continent to an island. The world shrinks and fresh-water fish don’t generally have such big ranges as marine ones. Some species are confined to single rivers or single lakes or even single pools, which makes them vulnerable to pollution and desiccation. So lungfish are a step towards life on land. Elsewhere, other fish step in other directions. Electrophorus electricus, the electric eel of South America, isn’t truly an eel but is truly alien. It uses electricity both as a weapon and as a sense, because it lives where vision isn’t always useful: in the “calm, turbid waters” of streams, rivers and swamps (“South America: Sharks, Rays, Sawfish and Electric Eel”, pg. 127). Some cave-dwelling fish have lost their eyes entirely, like Typhlichthys subterraneus, the southern cavefish of Tennessee and Kentucky (pg. 111). But Toxotes chatareus, the archerfish of Asia and northern Australia, has excellent eyesight, because it can squirt jets of water and “shoot insects” from overhanging branches up to five feet away: “Once it has knocked its target into the water it darts across to snap it up” (“Asia and Oceania: Other Perch-Like Fish”, pg. 231). This makes it popular with some aquarists. Other fish are popular for their appearance, not their behaviour. Fresh-water fish can’t match the range of colour and patterns found in salt-water fish, but a shoal of neon or cardinal tetras, Paracheirodon innesi and P. axelrodi, is like a cloud of swimming jewels. Surprisingly for such a well-known aquarium fish, the neon tetra is restricted “in the wild to the tributary streams of the Solimões River, which flows into the Amazon” (“South America: Tetras”, pg. 140). The paintings here capture the beauty of both species: one of the good things about the natural history series to which this encyclopaedia belongs is that it uses paintings to illustrate the main text, not photography. Capturing the shine, shape and colour of fish is a challenge to artists, so when they meet the challenge their art rewards the observer. 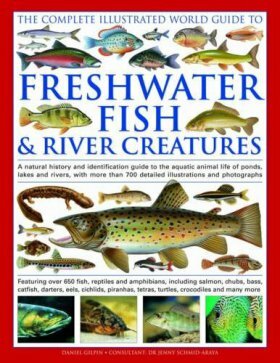 The amphibians, reptiles and mammals also covered here are less challenging, so less rewarding, but they’re few in number and fish dominate the book. I like that dominance and I like the maps that open each geographic section. Rivers and lakes are prominently marked, from the Amazon to the Mississippi, from the Nile to the Euphrates, from Lake Victoria to the Caspian Sea. There’s lots of interesting information here and lots of attractive art. Fish are strange creatures and that strangeness seems to strengthen in that everyday liquid we call fresh water. But water is strange too, wherever you find it and whatever it tastes like. It’s still being studied, still throwing up surprises, despite the simplicity of its composition: two atoms of hydrogen to one atom of oxygen. We should remember that as we read books like this.